Stinging insects can be both nuisances and painful, and getting rid of them from your property can be just as painful. Stinging pests tend to come out in the spring and die off around the beginning of the fall; just when everyone’s going outside to enjoy the beautiful weather! While most are passive creatures, some can be quite aggressive towards humans, and all have no problem defending their nests from perceived threats. Click the links below for more detailed descriptions of the “Big Four”stinging Insects you are likely to encounter in the Portland OR and Vancouver WA areas. 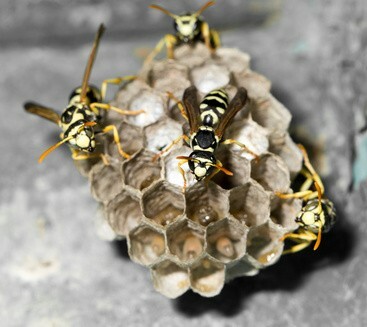 Nests tend to spring up on people, and most of these insects are fond of making their homes in human dwellings. Nests can be found in bushes and in eaves in homes, which means that some of these pests will invariably make their way indoors. If you or a family member is allergic to stinging pests, having them anywhere can be intimidating; an allergic reaction can range from burning and redness at the sting site to anaphylactic shock! While it is common knowledge that most stinging insects are attracted to the nectar in flowers, it might surprise you to know that most stinging insects enjoy sugary drinks, like soda and juice, as meal sources as well. Some are known to prey on other insects, and even go through garbage to find their food! It is no wonder they like to make themselves at home around a house! Bloom offers different means of handling them in a safe and efficient way, and can remove nests from your property. A professional bee exterminator from Bloom Pest Control offers expert Bees – Wasps – Yellow Jackets – Hornet Extermination & more in the Portland Or and Vancouver Wa areas. If you’re having problems controlling your outdoor areas, and bee’s have taken over, call us today. Honey and Bumblebees are pollinators and are very important to our eco-system. At Bloom we encourage the use of beekeepers that are able to safely trap and relocate swarms of honey bees. Honey & Bumblebee control can be tricky, but with some expert advice, we can help protect our eco-system as well as help you reclaim your outdoor areas. There are, however, times that might require a swarm or hive to be destroyed; in this unfortunate event Bloom Pest Control can take care of this for you. Bees and Wasps can be very dangerous. Personal injury and property damage are very real possibilities when dealing with these populations. Our experts will come to your home and accurately identify the type of colony to decide the proper course of action based on the type of bee or wasp.